We are a small organic farm in the foothills of the White Carpathian Mountains (Bílé Karpaty) close to the Czech-Slovak border. We are focused on the preservation of heritage vegetables, numerous fruit varieties, and poultry breeds. We offer a wide range of vegetables - more than 500 varieties, including 150 different types of tomatoes, 30 types of beans, including 9 garbanzo varieties, and 100 garlic varieties. Our products are sold locally. However, most of our products can be delivered by post throughout the Czech and Slovak Republics directly to your home or work address by next-day delivery. Garlic, dried fruit, dried herbs, honey and eggs are all shipped by post throughout Europe (delivery within 2-5 days). On our farm we grow nearly 100 different garlic varieties. We're excited to share this unique culinary treasure with you. Our cloves are of a different colour, size, shape and taste. The taste is mostly very strong, because Czech consumers like garlic as strong as possible. Each garlic bulb is marked with the variety's name. If you already know which variety of garlic you like best, please feel free to buy a single variety. 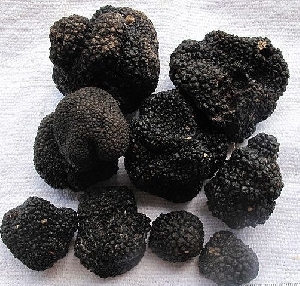 Many people consider truffles as a luxury food mainly from France or Italy. However, there are many written records about truffle hunting in Western Slovakia. The oldest one dates from 1588. Lots of truffle recipes in the cookbook from 1870 suggest that truffles were a normal part of the diet of our ancestors. On the Slovak side of the White Carpathian Montains truffle picking was very popular in the past and truffles were commonly sold on local markets until 1948. One trader redeemed from local truffle hunters around 300 kg of truffles each year in the period 1895-1909. Leading Czech mycologists advised the possibility of truffles cultivation in the truffle orchards (truffières) in our country already 100 years ago. Unfortunately, Czech experimental truffle orchards were later destroyed. Artificial truffles cultivation was brought to perfection in southern Europe. We have thoroughly familiarize ourselves with the latest knowledge and we have decided to restore the former glory of truffles in our region. We grow 3 truffle species in our truffle orchard: Black truffle (Tuber melanosporum) native to South Europe, and 2 species native to our region - Summer truffle (Tuber aestivum) and White truffle (Tuber borchii). 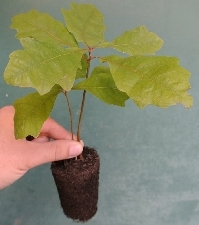 We offer Common Hazel (Corylus avellana) and English Oak (Quercus robur) trees inoculated with the truffles. Other tree species available on request. 3 truffle species are available: Black truffle (Tuber melanosporum), Summer truffle (Tuber aestivum) and white truffle (Tuber borchii). Are you tired of searching for quality organic vegetables? Perhaps you've noticed, it's often difficult to buy quality vegetables in Czech supermarkets. Most supermarket vegetables are imported from all around the world, and they're often of poor quality and stored for extended periods of time in refrigerators. And, the range of variety for each vegetable is very limited, there are often only 1 or 2 varieties. Tomatoes - in the supermarket you can find only standard size and cherry tomatoes. On our farm we grow white, yellow, orange, pink, red, purple, blue, green, chocolate and black tomatoes. When it comes to the size and shape - cherry tomatoes, pear tomatoes, currant tomatoes, large plum and giant tomatoes are all available. Unlike the supermarkets where only red radishes can be found, on our farm we grow white, yellow, red, pink, purple, black, both oval shape as well as carrot like radish. Are you looking for traditional varieties of vegetables you're used to eating in your home country, but you're unable to find in Czech supermarkets? Taste our products, taste the difference. On our farm we are keen on traditional varieties. We are fascinated by plant biodiversity. We grow them with love, we do not treat them with pesticides, and we only sell high quality products - the same products we want to eat. We grow a wide range of traditional European and Asian vegetable, including many French, Italian, Turkish, Iranian, and Pakistani local varieties. We are glad to grow what you like. Feel free to tell what we're missing. Furthermore, we are proud to offer you a wide range of traditional Czech and Moravian regional landrace varieties, which are now nearly extinct. We are creating a new fruit orchard with regional fruit varieties. Many of these apple or pear varieties have never been eaten outside of the White Carpathian Mountains (Bílé Karpaty). Interested in our offer? Email us at fb[AT]farmablatnicka[dot]eu and learn about our current offer. You can buy our products personally on our farm in Blatnička or you can pick them up in surrounding cities, where we deliver on a regular basis. If you live far away from us, we can deliver most of our product by Czech or Slovak Post. Today's harvested vegetables will reach you next day by noon. Shipping costs range from 100 CZK or 4 EUR only. Don't miss the latest news from our farm! Learn more about our current offerings, invitations to visit and pick produce yourself, and more, directly in your mailbox.